The Nutrition Health Booklet has been added successfully to your wishlist. Written by Neal Barnard, M.D., and the Barnard Medical Center’s clinical staff, this 15-page guide was designed for clinicians to use to introduce their patients to a plant-based diet. It provides the basics of good nutrition and shows you how to put them to work. Sections include: tackling weight control, tackling diabetes, tackling cholesterol, tackling blood pressure, and how to begin a plant-based diet. 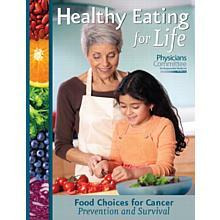 This evidence-based guide, used with every patient seen at the Barnard Medical Center, also includes 15 recipes and an ingredient substitution chart.